Victoria Biggs, managing director of MSLGroup London's consumer practice, picks the second in our series of PR professionals' favourite Christmas work. Like any great campaign, this one starts with a great story. In 1955, NORAD (North American Aerospace Defense Command) published an ad encouraging children to phone Santa – but gave the wrong number. The man in charge, Colonel Harry Shoup, made amends by instructing his staff to answer all calls with an update on Santa’s whereabouts. 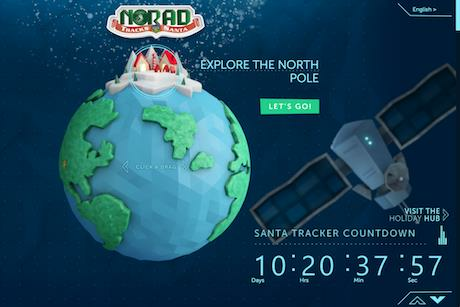 The NORAD Santa Tracker has followed Santa on his annual journey around the world for the last 57 years. Tracking became more advanced thanks to Google Maps and Google Earth in 2007 but in 2012, NORAD switched to Microsoft. This year, there is a new website that counts down the days until Father Christmas starts delivering presents, lets you visit the digital North Pole and releases a new game every day. From Christmas Eve, you can follow Santa and the reindeer on a map and count the presents being delivered. The tracker has its own Twitter, Facebook and YouTube accounts. You can still call but now there is the option to contact Santa on Skype or email. In 2012, 22 million people received ‘real time’ updates on Santa’s trip across the globe. I love everything about this campaign. I love the fact that the American airforces busy themselves tracking Santa rather than defending airspace in the run up to Christmas (though, of course, they are keeping the skies safe for the great man). I love the story behind it. I love the way the tracker has developed into a thoroughly 21st century digitally led, interactive, content rich campaign… but is still rooted in something human and wonderful. Enjoy!